This watch takes its name from a very famous porcelain factory located in the western part of Frankfurt - the Hochst Porzellanmanufaktur. 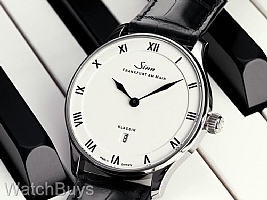 This factory was founded in 1746 and is known throughout the world for their fine hand made porcelain products, and their designs served as the inspiration of this watch, especially the enamel dial. The Sinn 1746 Klassik demonstrates Sinn's ability to create enduring timepieces which have both style and individuality. A pure white enamel dial combined with black hands and black Roman numeral markers make this watch extremely easy to read. Enamel dials are relatively rare on wrist watches today, and require very specialized production techniques. They are costly to produce, and many dials are destroyed in the production process when trying to get the finish just right. The end result however is striking. Contributing to this legibility is the use of a slightly domed anti-reflective coated sapphire crystal and a separate dial ring for the hour markers. The automatic winding movement is elaborately decorated with Cotes de Genve, perlage, and blued screws all visible through a sapphire crystal. We love the case - it's the perfect size at 42 mm case and is in 316L polished stainless steel. The crown is sealed with Sinn's crown system D3 (direkt-doppel-dichtend) making the watch water resistant to 100 meters without the need of a screw down function. This watch is fitted with a grain black calf leather strap and a signed Sinn stainless steel tang buckle. This watch is also available in a smaller 36 mm case as the Sinn 1736 Klassik. Verified Owner Comments: Unbelievable style and quality! 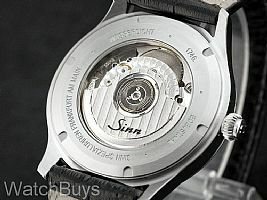 I will own another Sinn.